One of the things that man has wished we had since the beginning of time is the ability to see in the dark. Who wouldn't like to get up in the middle of the night and not bump into their nightstand because they can't see? Unfortunately, we can't see in the dark, but we can invent binoculars that can do it for us. That's where night vision binoculars come in. There are several different kinds of night vision binoculars. Some are more expensive than others, but some work better than others too. If you want total night vision capability, then you will have to pay for it. If you want good binoculars that can help you see in the dark, you won't have to pay as much for them. One type of night vision binocular that is popular is any binocular that has both multi-coated optics and a wide objective lens. With these, your binoculars will gather light more effectively and help you see in the dark. If you want to pay a bit more money, but get even better night vision capability, you can look at getting a binocular with wide objective lenses, multi-coated optics and a built in illuminator. The built in illuminator comes in some military binoculars and greatly enhance sight in the dark. They are generally adjustable, so you can adjust the illumination to suit your conditions. Intensifier tubes are also a good feature to have. Some binoculars that have illuminators are equipped to automatically adjust the brightness level. The grand daddy of them all is the thermal imaging binocular. These night vision binoculars are the best ones you can get. No matter how dark it is, you can see with a thermal imager. But they are also very expensive, costing between ten thousand and fifteen thousand dollars. Most hunting binoculars and military binoculars have good light gathering ability. While this doesn't mean you will be able to see in the dark, you will be able to see in low light conditions better with them, than without them. Night vision binoculars also come in varying forms. You can buy some that are hand held and look similar to a camera. Some can be mounted on a helmet, so that they resemble goggles and some look just like your regular run of the mill binocular whilst other mountable's have one lens that protrudes over one eye, and make you look like a cyborg. You can also buy digital binoculars with night vision capability. They generally aren't as good as plain night vision binoculars, but they are available and many outdoor enthusiasts use them and like them. You can also buy night vision riflescopes. These devices act like a binocular and can be mounted directly onto a rifle. Most serious rifle hunters swear by these devices and won't leave home without them. So who has these night vision binoculars? Many companies carry them. In fact, almost every binocular company has a version, but there are some companies that are especially good at what they do, and their night vision binoculars are very good. These companies include Steiner, Bushnell and Nikon. Steiner is particularly expensive but well made and Bushnell and Nikon are expensive, but very good as well. If you want quality craftsmanship, you have to pay for it. If you are a hunter or someone who like's to view the night time wildlife, you're going to need some kind of night vision binocular. 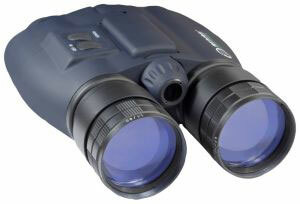 Read some reviews and see which ones are the best binoculars, and take the time to shop around.